Okay, let’s get this out of the way right off the bat—despite their polarizing nature, skinny jeans will never really go “out.” Whether you love or loathe them, the silhouette is more or less a staple at this point. That said, there are often styles that crop up that give skinnies a run for their money. To spot the latest denim trend, we tend to look to our favorite fashion girls on Instagram to inform our next jean purchases. While not necessarily “new,” there’s one pair of jeans we’ve been spotting at the top of the IG feeds—cropped straight-leg jeans. We’ve seen this denim style make waves through the fashion universe for seasons now, and it appears the forward look isn’t going away anytime soon because they really do add a cool, laid-back twist to any ensemble. 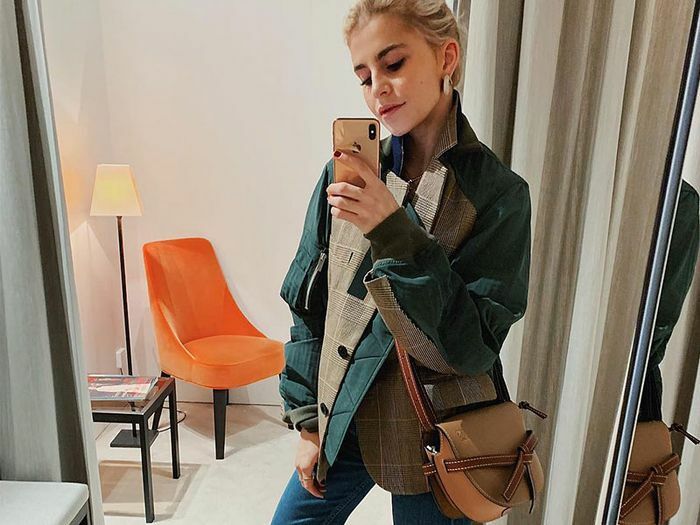 At present, the fashion elite is pairing their cropped straight-leg jeans with statement coats and boots, chunky sweaters and heels, and everything in-between. If you’re ready to give your skinnies a break, keep scrolling to check out how fashion people are wearing their straight-leg jeans now. Plus, shop out favorite styles as well. Cuff your jeans to showcase an unexpected detail with a coordinating sweater. This may just be your new go-to weekend look—a statement coat, straight-leg jeans, and white sneakers. If denim-on-denim is your vibe, try this 'fit with patent booties, a chain belt, and a furry coat. Show off an eye-catching pair of booties with your cropped jeans, complete with a statement coat. You can't go wrong with the pullover and jeans combo. It's a classic look paired with a gorgeous coat and ankle boots. If you work in a creative setting and interested in wearing your straight-leg jeans to work, test out this ensemble with the fitted blazer and low heels. Running around off-duty? Slip into your favorite jeans with a pair of "ugly" sneakers and a vibrant parka for an on-trend look. A pair of light-wash jeans feels fresh with a rainbow-striped sweater and chunky boots. Your cropped jeans bring a laid-back feel to this elevated outfit featuring an intricate coat and snakeskin boots. One uniform that just always works? A leather jacket, those straight jeans, and black ankle boots. Next, check out the skinny jean "mistakes" celebs wear.